Spring has arrived and all we need now is some lovely warm sunny days to get us ready for the Summer, and I for one cant wait. Today it is pouring with rain here in the Waikato. A couple of weeks ago I flew down to Christchurch and did the Mary's Market there on the Saturday and it was lovely to meet so many of our customers plus heaps of lovely new ones as well, and next year we will have some of our stock down there at each of the markets. Was also great to spend some time with my family. We are well under way with our new summer range and have some really cool prints this year from Frozen, Fairies, Doc McStuffins, My Little Pony and Lego to name just a few. At long last we have got our girls reversible sun hat sorted out with the opening at the back for the long hair or pony tail to fit through as per the pic just below, the hat is adjustable to 3 different positions (underneath where the opening is), so far we are making it in two sizes for the children 1/3 and 4/8 years and are now working on an adult version due to so many requests for it from our mums, they are very popular and to celebrate we are offering a discount of 20% off each hat in the Pony tail one for till the end of October, so if you would like one just go onto the photo and it will take you to these hats and order a hat and in the promo box but PONY TAIL and it will give you your discount. Please note dont leave it too long if there is a certain print or design your child would like as we are carrying huge amounts of the fabrics. Not be be out done we have also done a boys reversible hat and have a range of cool patterns on one side and plain on the other and these come with the cord to help keep them on and in two sizes 1/3 and 4/8 years. Our prem merino baby clothing is very popular and we are looking at bringing in a summer range as well but the merino will be available all year round though. 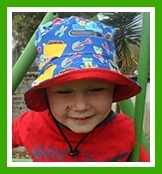 Baby Sun Hats are well underway now and all the patterns available will be on the website by the end of next week. Several of the hats go with the outfits that we are slowly getting finished and will be up on the website shortly. We are even catering for the boys in the Baby gear with some cute rompers on the sewing table at the moment. If any of you are looking to earn a little extra money we are looking for some more Home Consultants to join our team where you can earn commission on everything you sell, it does not cost anything to set up with us. If you are interested please drop me a email at accounts@kruizeykidz.co.nz and we can send you all the information, this more for our merino and waterproof clothing which you would be able to start selling early next year plus we do add other pieces of our range into it or if you wanted to start earlier you are most welcome to do so. 20th September, Tamahere Country Market. 28th September, Titirangi Village Market, Auckland. 4th October, Matamata A & P Show. 11th October, Marys Market, Auckland. 18th October, Tamahere Country Market. 22nd October, Cambridge Road Kindy Pop Up Christmas Market.